Taking place between the two Jazz Fest weekends, the fourth annual NOLA Crawfish Fest features three days of live music, beer, and some 6,000 pounds of boiled crawfish conjured by the NOLA Crawfish King himself, Chris “Shaggy” Davis. The fest will take place at Central City BBQ (1201 South Rampart Street) starting on Monday, April 29, through Wednesday, May 1 (3-10 p.m.) The timing might seem unusual, as most New Orleans festivals take place over the weekend, but with all the Jazz Fest fans in town looking to celebrate local culture between the two Jazz Fest-filled weekends this in fact seems perfect. The venue, Central City BBQ, is a compound that stretches for half a block, containing a smokehouse, a BBQ restaurant, and an event space with a large yard and picnic tables. 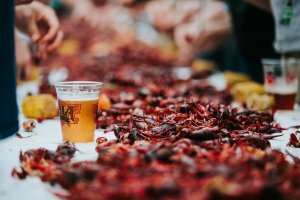 Besides a stellar lineup of live music the fest also features a crawfish cookoff and an eating contest. The 4th Annual Louisiana Fish Fry Ultimate Cook-off takes place on Wednesday, May 1 and the 2nd Annual Crawifsh Eatin’ Competition takes place on Tuesday April 30th. The annual cookoff will start at 3 p.m. on Wednesday, and anyone is invited to sign up for a chance to boil their best sack of crawfish with their choice of fixings. About 20 two-person teams are expected to compete in front of the local celebrity judges, who will pick a winner based on taste, fixings, and spice level. The judging begins at 5 p.m. with the winning team will being announced at 6 p.m. If you plan to compete you’ll need another person for your team, your own boiling rig, the recipe, and the fixings; 40 pounds of fresh Louisiana crawfish will be provided. The entrance fee is $50 per team. The eating contest is coming back after its inaugural year to give you a chance to eat as much crawfish as you can in the allotted 7 minutes. The winner gets $100 and bragging rights, and all participants who sign up gain free admission to the festival on the day of the contest. NOLA Crawfish Fest focuses on featuring local musicians, so this is a great chance to see them jam outside of the Fair Grounds and in a much smaller, more intimate setting. On Monday, George Porter, Jr, Dave Malone, Billy Iuso and Terrence Higgins are banding together to perform as the NOLA Crawfish Allstars. Neville Jacobs will perform with Cris Jacobs, Ivan Neville, Tony Hall, and Brady Blade. The ever popular Soul Brass Band is also scheduled to perform on Monday. On Tuesday, you’ll get to enjoy the Mike Dillon Band and Eric Krasno and Friends; while Wednesday will bring out Anders Osborne and Papa Mali, among others. The NOLA Crawfish Fest tickets are available for each day and in three-day VIP packages. General admission per day is $40 ($50 with a single order of crawfish included, which will get you 2 to 3 pounds). VIP packages start at $150. There will be other kinds of food besides crawfish available for purchase, as well as drinks. The organizers ask that you don’t bring festival chairs as there’s plenty of seating around the stage and in the food area. 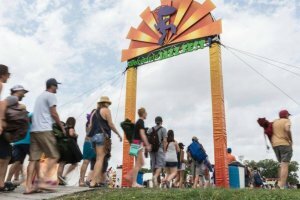 In terms of getting there and parking, Jazz Fest is always a very busy time in New Orleans, so expect traffic but a rideshare or a cab are both good transportation options. So is biking, and there is bike parking at the venue. If you plan to drive to the fest street parking is limited. Finally, NOLA Crawfish Fest is rain or shine (so no refunds). You can get updates on the event here. We hope you enjoy this chance to celebrate the Louisiana crawfish season!